First, let me assure you that I am not one to advocate opening a tube (or a box or a can for that matter) and calling it dinner, but this dang umami in a tube has been taunting me for more than a year. British food writer Laura Santtini’s Taste No. 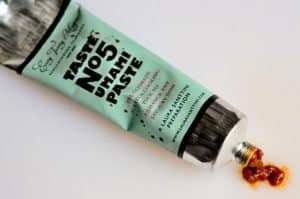 5 Umami Paste first started popping up on the food blogs in late 2009, but on this side of the pond, we were SOL, as they say. The fabled tubes of “deliciousness” (that’s a rough translation of the Japanese word umami) were only available in the UK. Discovered by a Japanese scientist, Dr. Kikunae Ikeda, more than 100 years ago, umami is the fifth taste, rounding out the flavor party made up of the usual suspects sweet, sour, bitter, and salty. Dr. Ikeda described umami as “A common and yet absolutely singular taste which cannot be called sweet, or sour, or salty, or bitter…” It can be isolated in certain seaweeds, mushrooms, asparagus, cheese, tomatoes, and meat. And now, thanks to Santtini, who is also the author of the cookbook Easy Tasty Italian, it can be squeezed right out of a tube. When the paste finally became available in this country, I quickly snapped up a 3-pack from Amazon. When it arrived on my doorstep, I anxiously ripped open the box, poked open the first tube and I’m pretty sure I was still standing on my stoop when I took my first straight-up taste. It wasn’t the revolutionary, mind-blowing flavor sensation I’d half expected due to all the hype, but it was mighty tasty to be sure. Instead of a deeply mysterious, distilled “deliciousness,” it tasted to me like the best tomato paste ever—deep, rich, fruity tomato flavor laced with a slightly oily and pungent fishiness from anchovies, creamy parmesan, bright garlic, earthy mushrooms and olives. Calmer now, I took the treasured paste inside and tried cooking with it. Several tablespoons added to a mixture of ground turkey, minced onions, breadcrumbs, an egg, and a dollop of sour cream added a welcome complexity to my usually somewhat pedestrian turkey meatloaf, though it was a bit lost in all the hubbub. So for my next umami experiment, I simply mixed the paste half-and half with softened unsalted butter, then spread the mixture over and under the skin of some chicken leg quarters, which were then roasted in the oven, over a bed of quartered small red potatoes, until browned and crisp. Oh wow, now that’s umami. And a shamelessly easy recipe that turns a boring chicken-and-potatoes dinner into, well, utter deliciousness. I’ve got two tubes left from my initial purchase and already I’ve got dozens of ideas for how to put them to good use—squeezed into pasta sauces; paired with goat cheese as a topping for crostini; squirted on pizza crust before it is topped with cheese; mixed into a vinaigrette; as a garnish for The Lazy Gourmet’s Smoked Trout Brandade; and so much more. Discovered by a Japanese scientist, Dr. Kikunae Ikeda, more than 100 years ago, umami is the fifth taste, rounding out the flavor party made up of the usual suspects sweet, sour, bitter, and salty. Dr. Ikeda described umami as “A common and yet absolutely singular taste which cannot be called sweet, or sour, or salty, or bitter…” This recipe uses Laura Santtini’s Taste No. 5 Umami Paste to turn a boring chicken-and-potatoes dinner into utter deliciousness. In a large baking dish, toss potatoes with olive oil, spread out in a single layer, and sprinkle with salt. In a small bowl, mix Umami Paste and butter until well combined. Taste and add salt if desired. Spread umami-butter mixture all over the chicken pieces, including under the skin. Arrange the chicken pieces on top of the potatoes in a single layer. Roast in preheated oven about 60 to 75 minutes, basting occasionally, until chicken is cooked through. If desired, place under a preheated broiler for 2 minutes just before serving to crisp the skin. Serve immediately.